Peel the onion, then chop into small pieces. De-seed and chop the chiles into small pieces too. Heat the oil in a large skillet and sprinkle the salt and pepper onto the skin side of the chicken breasts. Place in the pan skin-side down and cook on medium-high heat for five minutes. Turn the chicken over and cook for a further five minutes. Add the onion, green and red chiles, garlic, cumin, coriander, paprika and saffron to the pan and stir until the onions are coated in the spices. Cook for three minutes, stirring occasionally until the onion starts to soften. While the onion mixture is cooking, remove the seeds from the pomegranate. Take a medium-sized bowl and hold the cut side of the pomegranate in your hand. Create a cup with your hand and hold it over the bowl. Whack the back of the pomegranate with a wooden spoon and the seeds will fall into your hand. Then you can tip them into the bowl. Any stubborn seeds can be removed by pulling the skin of the pomegranate outward a little, then repeating the spoon whacking until all seeds are removed. Put the seeds to one side. Peel the zest from the lemons and squeeze the juice into a small bowl. Put to one side. Add the stock and bring to a boil, place the lid on and simmer for ten minutes. 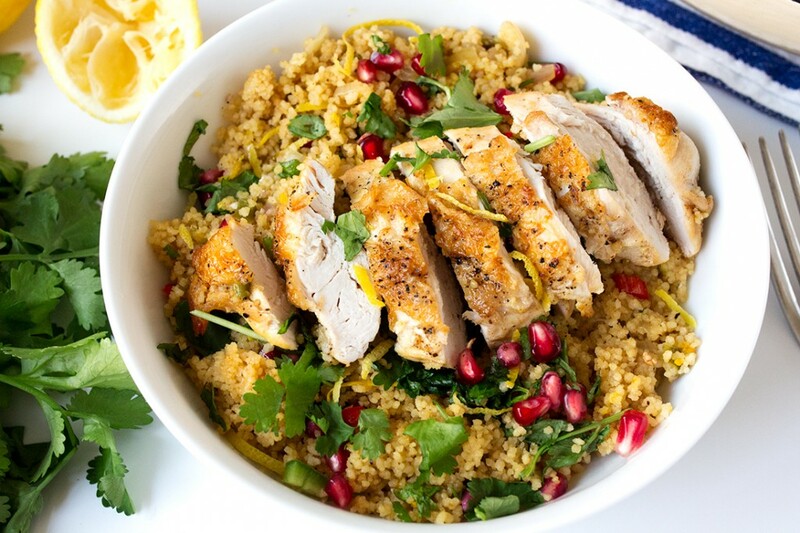 Take the lid off and pour in half the lemon juice, then carefully add in the couscous to the sides of the chicken, making sure not to leave any couscous on top of the chicken (as it won’t get cooked). You can move the chicken breasts to the side of the pan if it makes it easier. Stir everything, ensuring all of the couscous is covered, then place a lid on the skillet and turn the heat down to very low. Cook for five minutes, then turn off the heat. 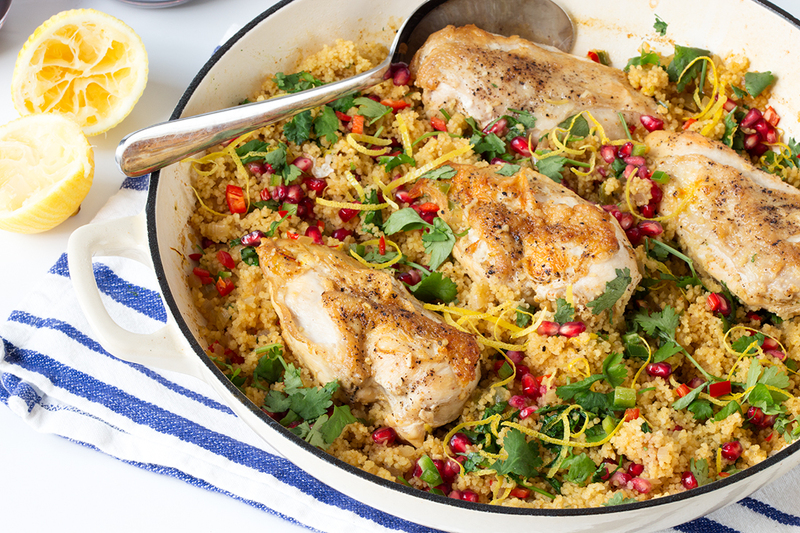 Take off the lid and fluff up the couscous with a fork. Add the zest from one of the lemons and all but one tablespoon of the cilantro. Stir into the couscous. 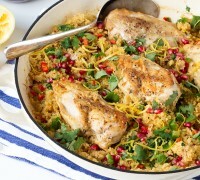 Top with the remaining lemon zest, the pomegranate seeds and the chopped parsley. Serve with the remaining lemon juice.